To protect University assets, UW-System has licensed security software from Cisco that will be used to secure UW-Platteville computers. This product protects computer assets and users by blocking a variety of security risks such as malware and phishing sites. This implementation is in compliance with Policy - Acceptable Use of Information Technology Resources . If you see the following web page on your computer, this indicates the site was blocked. 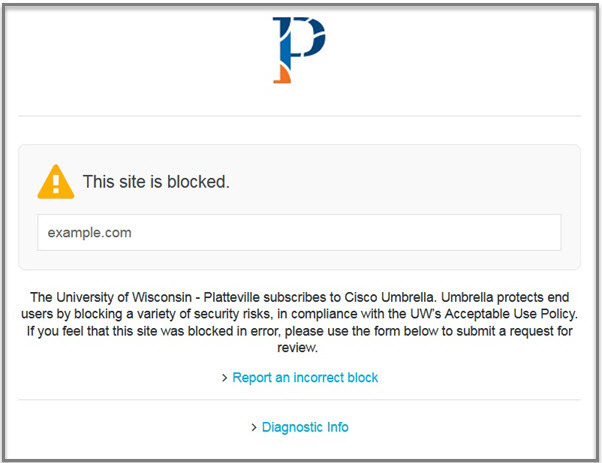 If you feel the site was blocked in error, please complete the form linked from the notice page to report this to UW-Platteville's Information Security team.